I was surprised how much of the HII starburst area came out on this one as I was barely seeing anything when capturing the HA data. After the subs were stacked and levels boosted they suddenly exploded into view. The image was cropped and zoomed a little bit. M82 is actually smaller than I expected. I guess it just looks bigger in the eyepiece due to its surface brightness. 90 subs for Lum 30 subs each RGB @ 30 sec. 20 subs HA @ 90 sec. 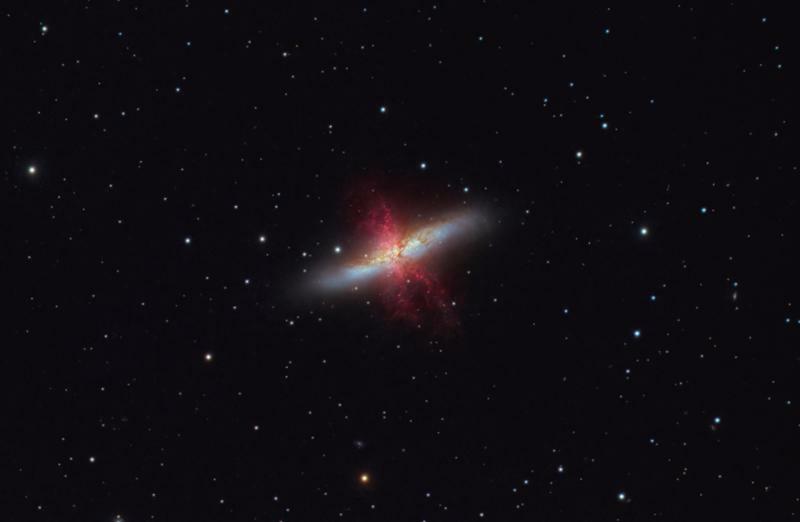 Masterfully done; one of the best M82's i've seen. Congratulations on a wonderfully acquired image. Excellent rendition. Good work and the Ha blend looks great!